EI Associates, a full-service architectural and engineering firm, and the Camp Hill School District entered into phase 2 of a 5-year long-range facilities plan that aims to provide much needed renovations to the Middle School/High School. Earlier this year, EI Associates completed a District-Wide, 5-year long-range facilities plan that evaluated the Camp Hill School District’s buildings. The study determined that the District’s buildings were in need of renovations in order to upgrade building infrastructure, meet code compliance, and address several interior and exteriors items showing their age. 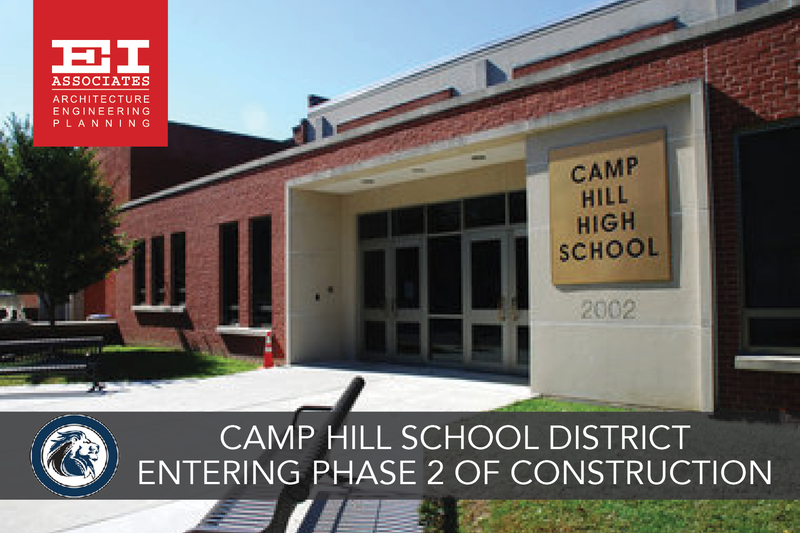 With the first phase of the 5-year long-range facilities plan almost complete, the Camp Hill School District has entered into phase 2 of their renovations to the Middle School / High School. Renovations consist of improvements to the exterior envelope of the building to include total window and doors replacement in an effort to mitigate water intrusion into the building along with the removal of classroom unit vents and installation of new casework. The Camp Hill School District’s Middle School / High School building is 141,000 sq. ft. in area with a PDE capacity of 973. District-wide facilities studies review the conditions of the overall facilities' including the site, existing buildings, and the educational environment. EI Associates has been successfully conducting and completing facilities studies for over 80 years.